The forbidden kingdom of Nepal, Upper Mustang is comprised of desolate deserts, medieval rock caves, and captivating Buddhist culture. 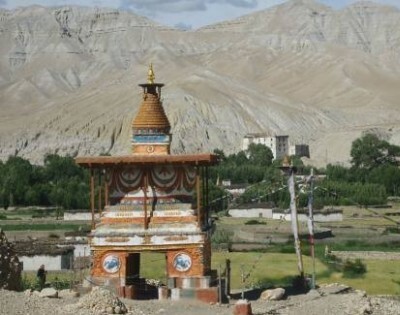 Until 1992, exploring Upper Mustang was outlawed to foreign trekkers, however, travelers still need to acquire the special permit to explore the vicinity of Upper Mustang. Dwelling in the trans-Himalayan area of Nepal, Upper Mustang can trek even during the monsoon season. The climate is cold during winter and is windy and dry throughout the year. The native inhabitants of the region are Thakali, Gurung, and Tibetan with their distinct set of culture and tradition. Jomsom is the bureaucratic center of Mustang which houses a domestic airport and has evolved as the gateway to Mustang since Nepal unlatched its door to foreign voyagers in 1992. Upper Mustang bestows an exceptional blend of both arid and verdant vegetation alongside outright sceneries and abundant Buddhist shrines. As the misty world of medieval Buddhist Kingdom, Upper Mustang has armored the divine Tibetan Buddhist culture till the date. The highest point conquered being 3800m, the vicinity of Upper Mustang can be trekked without any difficulties, although the situations might get arduous sometimes. Analogous to the Tibet Autonomous Region of the People’s Republic of China, Mustang bestows the overwhelming experience of Buddhist culture. The Tiji festival celebrated in Lo Manthang has been able to grab the attention of voyages around the globe. The festival symbolizes the victory of bravery over evil. This festival honors the victory of a son over a demon trying to shroud the Kingdom of Mustang with destruction. The major highlights of the trip include witnessing Buddhist culture, awe-inspiring arid and green landscapes, insight to Tibetan lifestyle, and exploration of ancient caves and monasteries along with amazing vista of Annapurna and Dhaulagiri massifs. The off the beaten trekking trails add more charm to the trek. Although the trip to Upper Mustang can be operated throughout the year, February and November are considered to be the best months to explore the pristine vicinity.